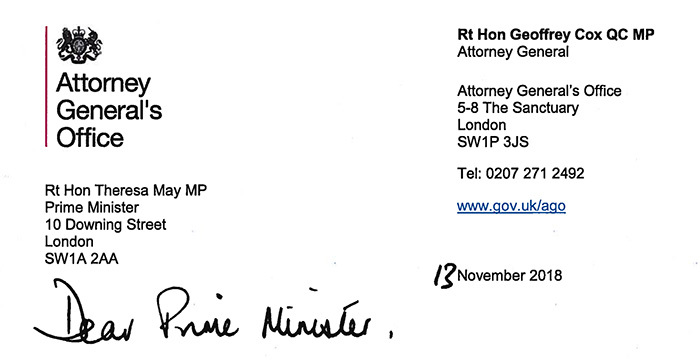 The Attorney-General Geoffrey Cox QC published the full legal advice on Theresa May’s Brexit deal this morning after the goverment was held in contempt of parliament yesterday for not doing so and only revealing a summary of the advice. The advice, which is only six pages long, is being avidly read by MPs in the House of Commons in real time, suggests that because of the nature of the Irish backstop arrangement in the Brexit deal, the UK could be trapped in “protracted and repeated rounds of negotiations” for years ahead. Within moments, Sir Keir Starmer, shadow Brexit secretary, took to Twitter, arguing the advice revealed “central weaknesses” in the UK government’s Brexit deal. The Brexit legal advice was requested by Starmer at the end of November on the grounds that MPs — who must vote on the Chequers deal in just six days’ time — are “entitled to know full legal implications of what the Prime Minister has signed up to. Full transparency and rigorous scrutiny essential” as he put it on Twitter. But the Government dragged its feet on this. Only this morning, Andrea Leadsom, Leader of the House of Commons, told the Radio 4 Today programme that it was a “very important breach” of centuries of convention of legal privilege to publish legal advice in this way. Legal privilege is not there for lawyers to give uninhibited advice to a client, but so that a client can be uninhibited in what they tell lawyers. A lawyer will and should be uninhibited in any event. That is their job. They do not need your protection. In an interesting aside, Stephens noted that it is unlikely that Cox himself would have actually written the advice; it would be usual for an attorney-general to seek advice from a legal expert in that field. In the other famous disclosure of advice to the government over the Iraq War disclosed in 2005, though Lord Goldsmith was the attorney general at the time, it was the now-former LSE law professor and international law expert Christopher Greenwood QC who actually wrote the advice. Stephens added: “The bar will probably spend much of the Christmas break trying to work out who it was that actually did the work!” For now, however, MPs and legal experts will be pouring over the 33 paragraphs of the advice to work out what it all means for the Brexit deal. Why? Will it somehow undermine the strength and solidity of our bargaining position? Hello! I am at ULaw today on a PSC session. Maybe the advice should have been classified. Strange U.K. doesn’t have such a rigorous national secrets classification system when it comes to the legislative body’s access to confidential Executive branch docs. In the US, Congress would have been allowed to see the advice perhaps but having been classified and in a private secure facility. That is if the Executive Branch chose not to exercise its privilege over internal presidential legal advice. A whole day was wasted yesterday asking for this advice to be disclosed. The advice given is obvious.All the main parties have lawyers as MP’s or members who are sufficiently experienced to provide their own legal advice on this issue to their respective parties. Yesterday was the very worst of Parliament and politicians. A whole day wasted where absolutely nothing was achieved. He is a great man, the future leader of this country, and fully deserving of his title. “Great man” lmao just another uncharistmatic apparatchik of the Macron variety – and the ordinary people don’t like it. Anyway your beloved EU is dead already. Long live Europe! The banksters give their pets these quaint titles like “Lord” and “Sir” almost as if we were dumb enough cattle to think there is some remote similarity between them and the great British statesmen of the nineteenth century. Of course we know that these new “Lords” and “Sirs” are impostors, drawing parasitically on the reputation of those who were immeasurably better than them. Given that we all know this now – that the Emperor has no clothes, so to speak – the ball is in your court. Yellow Vests are bringing down the globalist government in France. History is moving forward and it is time for the establishment to step down quietly and let change, which is inevitable, happen – and in the UK that means Brexit. Kinda obvious but – why don’t we just hard Brexit on WTO terms and then do a sweet trade deal with the USA? I guess tooooo many pigs have their noses in that great big EU trough. Is there anyone left who can honestly say that any of this is really worth it? I see this argument from Remainers a lot. I’m really not sure how you all think it is so convincing. It’s a bit like being the guy in the tunnel on a prison break saying “I told you the floor was muddy and at least we get food in our cells”. 17.4m people disliked the prison. Trying to argue that the prison has super tight security and that we might get a bit muddy leaving is not going to make *anyone* like the prison. Can Brexiteers please give substantial reasons why this “prison” – which is the most sophisticated trading bloc in the world, and which the UK had substantial voting rights, influence, vetos, rebates, benefits and preferential treatment in – is so bad? Can Brexiteers please give reasons arguments for this, without referring to Daily Mail trash which they’ve been brainwashed by? Can Brexiteers please justify why leaving this trading bloc will be like escaping a “prison?” Can Brexiteers outline what life will look like outside of this “prison?” Or will it be, as this legal document unequivocally tells us, simply be us following EU rules and regulations – but without having any say in writing the rules of the club? Can Brexiteers please tell us how it is feasible for a country to diverge from the shared standards of it’s closest trading partner, without significant damage? Can Brexiteers please tell us why diverging from EU standards, which is amplified into worldwide standards and rules, will be worth it? Can Brexiteers please justify why the loss of thousands of jobs, nearly a decade of business uncertainty and massive hits to wealth, influence and opportunities can be compared to a little bit of mud? It’s not a “trading bloc”, idiot. Go back to law school and do not pass go. I would agree with everything said by m’learned friend above and simply add that if you *define* the EU as a ‘prison’ then of course any argument you like can follow from there. In reality, it’s only Redwood, Cash and their ilk who see things that way. The majority of people who voted in 2016 recognised that what Brexit was about was swapping one set of imperfect political and economic arrangements for another. The real question remains – is it worth it? You know very well that what was sold in 2016 was not ‘Brexit at any cost’ but rather ‘Brexit at minimal cost’. Had it been the former it would have been lucky to garner 30% of the vote. The fact that the process is proving difficult and leading us into the ludicrous outcome of an indefinite backstop is not because the prison guards are turning the screw, but rather the inevitable consequence of (a) unravelling an already existing 40-year trading relationship and (b) that our only land border with the EU just so happens to be the site of armed conflict within living memory. This was pointed out before, during and after the referendum but certain Brexiteers either did not listen or did not care. Of course, it is the easy way out simply to say “the fact it’s so difficult to leave *proves* the need for us to leave in the first place!” In reality, you sound like nothing more than Soviet fellow-travellers who used to claim that the only problem with Communism was that it hadn’t been implemented properly. I think it’s sad that in 3 years Remainers still haven’t tried to argue a positive case for the EU. Calling people Retards and Racists and saying that Brexit simply “can’t be done” or is somehow “impossible” failed in June 2016. If you want to persuade people then you need new arguments, not more rudeness. Ridiculous. There has been abundant, consistent and widely reported economic analysis suggesting trade and prosperity will be better in the EU than out of it. That is the positive case. You may be just a law student so I’ll go easy on you. But can’t you see how ridiculous your answer sounds? It’s like defending in court on the basis that “My guy didn’t do it”, having the judge ask for details of your defence, and then answering “because lots of people say so”. The judge would be rightly thinking – wtf. To make a positive case you need ARGUMENT supported by EVIDENCE. Not just mere assertion. The fact that a presumably “educated” person can answer in this way shows sadly the effect of many years of pro-EU propaganda through the “education” system and mainstream media including, shamefully, the BBC (in serious betrayal of its historic mission). It is possibly correct to say that we may be better off if the EU didn’t exist. The fact is, it does. So long as it does, we are better off being a part of it. Also, if it didn’t exist, something else would soon in its place. It would also make sense to be a part of that. I’m surprised that David Allen Green isn’t more outraged at the fact that a client is being forced to disclose legal advice, in complete violation (as Leadsom correctly said) of basic principles of legal privilege. Gee, it’s almost as if Parliament is sovereign and a binding Parliamentary vote (rightly) supersedes legal privilege. Besides, the real reason the Conservatives attempted to block the release is because it is embarrassing. If Brexit really was a good idea they would be transparent about the implications of Brexit. The fact they are hiding everything shows you they are ashamed – deep deep down they know the British voters were lied to. It is a dear shame and a mistake for which we may have to pay a pretty penny for many years. Yet a dying horse is still mistakenly being flung as if it were dead, when in reality there is still a cure for this horrible predicament we find ourselves in. Should have instructed the top top titanic Greenberg Glusker. Hilarious how LC find it interesting and somewhat news that the advice was provided by counsel to the AG. Reminds me of mates who think doing civil lit knockaround work means I know criminal law inside out. If I provided a copy of that advice to a client they would not believe it was drafted by a QC due to it being heavily couched in terms and containing so many caveats. Brexit will be a catastrophe for our great nation. We need to reverse course.